Glass, Tritan, stainless steel and aluminum, plastic—the choices can be overwhelming and there are many subtleties within each of these material categories. So, when comparing bottles that LOOK the same, dig deeper to make sure the steel is the same grade, or that it’s the same plastic composition. If you’re not sure, ask! Do you have a picture in your mind of how your logo will go on the bottle? Check the layout options for each bottle that you’re considering. You can wrap your artwork around many bottles, but some offer one-sided printing only—and that area can be smaller than you’d think. Have a multi-colored vision for your messaging? Not all bottles can be printed in multiple or full color. Water Bottles Made In ? Where the bottle is made doesn’t matter to a lot of clients. However, if your company culture—or desire—is to source close to home, USA-made water bottles will likely be on top of your list. It’s hard to find metal bottles made in America (we only have one! ), but most of our plastic bottles are. Whether it’s manufactured in the USA or overseas, every bottle is bound equally to CPSIA product safety guidelines (see #1 above). We know it does. That’s why we try hard to keep our prices competitive while offering expert product safety advice and top-notch customer service. There will always be something less (and more!) expensive out there. But consider the possible hidden cost of bargain shopping for bulk water bottles. Then, consider us! Can I get a quote on 50 red water bottles. A smaller version to suite toddlers. We would like white logo to be printed on it. 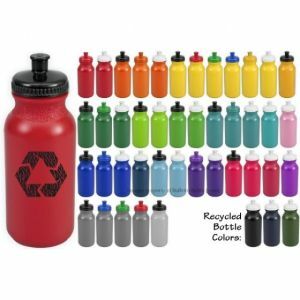 I would like the bottles to be BPA free if possible? Hi there! Of course! We’ll reach out to you this morning via email. You are also welcome to email us directly at team@bulletinbrands.com. We look forward to working with you!